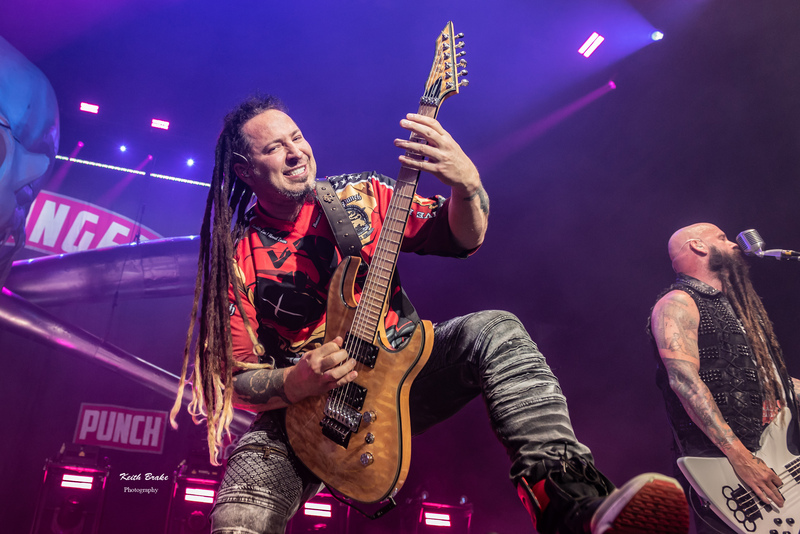 Five Finger Death Punch performing at Hollywood Casino Amphitheare in Saint Louis Tuesday. Photo by Keith Brake Photography. Man, what a summer it has been so far in Saint Louis for music lovers; this past Tuesday (8/7/2018) was another addition to an already great year. Hollywood Casino Amphitheatre hosted a heavy hitting hard rocking show featuring some of the biggest names going. Breaking Benjamin was the headlining act for this date with support from Five Finger Death Punch, Bad Wolves and Nothing More. When the music started a hot Midwestern evening got a little hotter. 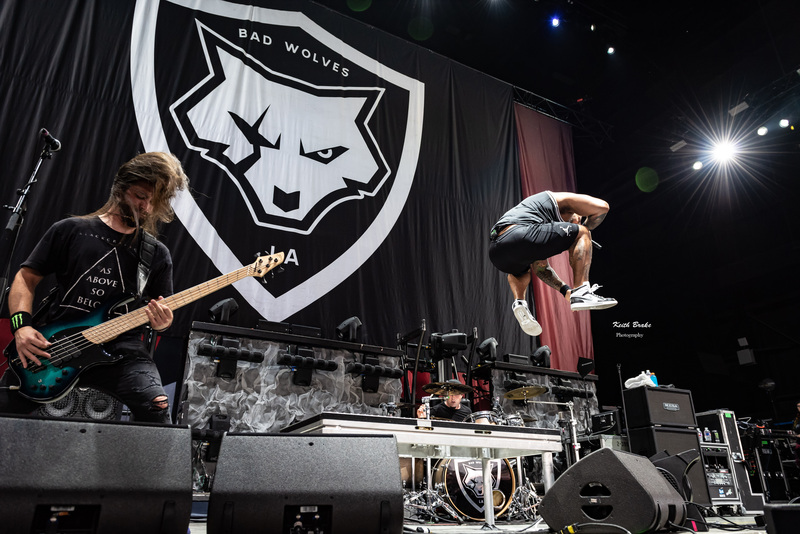 Bad Wolves performing at Hollywood Casino Amphitheare in Saint Louis Tuesday. Photo by Keith Brake Photography. Bad Wolves took the stage to kick things off, led by their front man Tommy Vext. This band was thrust directly into the spotlight when they covered the iconic Cranberries song Zombie and donated the proceeds to the late Deloris O’riordarn’s (vocalist/Cranberries) children upon hearing of her untimely death. Vext is an imposing presence on stage and performs with much love and energy for the fans. Hailing from Los Angeles CA, Bad Wolves are all smiles when they are at work, it is always nice to see a group appreciate where they are in life. 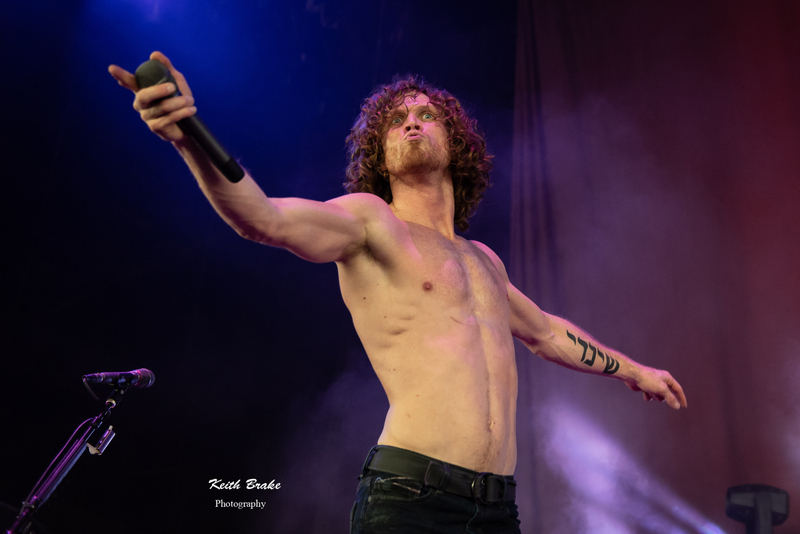 As I was entering the photo pit for the second act, Tommy was still in front of the stage showing love and attention to his extended heavy metal family. Nothing More performing at Hollywood Casino Amphitheare in Saint Louis Tuesday. Photo by Keith Brake Photography. Next up was Nothing More, and I must say, my GOD do these kids bring it! This three time Grammy nominated group has stage presence and charisma second to no band going today. Lead vocalist Jonny Hawkins, flanked by fellow founding member Mark Vollelunga ( Guitar/vox) Daniel Oliver (bass) and drummer Ben Anderson, own you from the moment they take the stage. The music is tight, and has a unique feel and style; combined with Hawkins’ powerful vocals this four piece is a true show stopper in my opinion. The Nothing More set would have stolen the whole evening if not for what turned out to be an amazingly strong FFDP performance. Breaking Benjamin performing at Hollywood Casino Amphitheare in Saint Louis Tuesday. Photo by Keith Brake Photography. By the time Breaking Benjamin was ready to take the stage the crowd was in near fever pitch. Donnie Fandango (105.7 The Point) came across the PA and asked “Saint Louis! 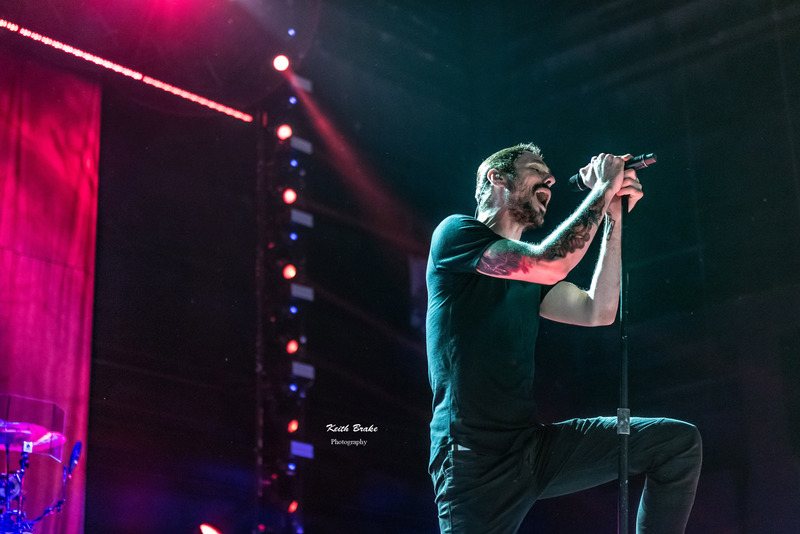 Are you ready for YOUR band?” rawkus applause erupted as Benjamin Burnley and the rest of the boys took the stage. The rest of the set proceeded in near disappointing fashion as the energy and chemistry never seemed to make it any higher than the excitement of anticipation. 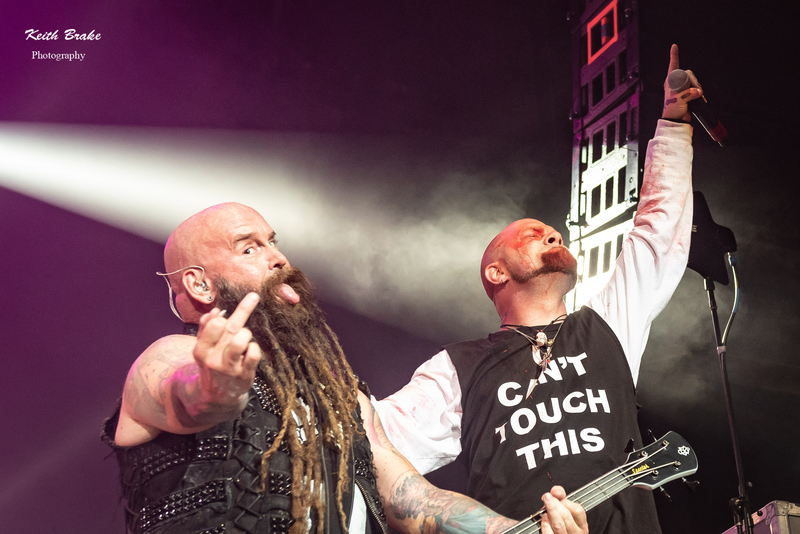 Now, do not misinterpret what I am saying, Ben and the boys were as good as ever but the bar had been set at such a level by FFDP that not even the love affair that Breaking Benjamin and Saint Louis have could overcome it. The performance was strong and tight, my favorite moments of the set were a five song cover medley featuring selections from Metallica, Nirvana and A Perfect Circle and a spot on album quality performance of “Breath”, my absolute favorite BB song. This tour is hands down worth seeing, for that matter ANY of these groups are worth the price of admission and to have them all together for the price of one ticket seems like such a no-brainer to any heavy metal music lover. Be sure to Check out Bad Wolves https://badwolvesnation.com/ and Nothing More http://nothingmore.net/ if you are not familiar with these groups. Thanks for the support all, peace. I was the one Ivan gave the cross necklace he was wearing that night. You can see it in the pics of him. Still can’t believe he pick me!